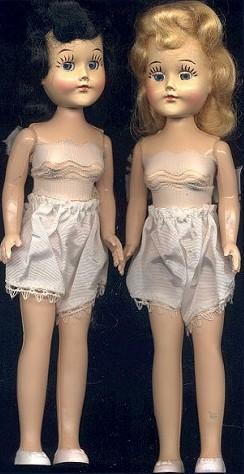 1950s Doll Bodies Lingerie-Lou doll, 12" tall, Dress Me doll type, is jointed at the neck and shoulders, sleep eyes with eyelashes, pierced ears with pearl earrings, mohair wig, molded painted shoes, had an eight piece clothing wardrobe, by Doll Bodies, Inc.
1952-1953 Doll Bodies Mary-Lu Walker doll, 8", 14" and (shown) 18" tall, hard plastic, blue sleep eyes, 8" size is a Ginny look a like, hair in pig tails, molded bow shoes, dolls are unmarked or marked Doll Bodies, Inc. Some sizes are marked only with a wrist tag. 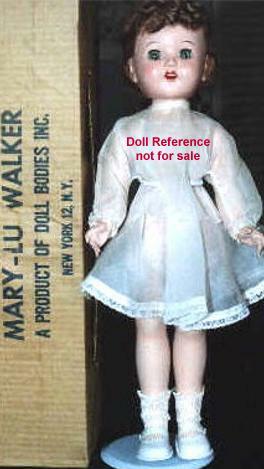 1959-1960s Doll Bodies LuAnn doll, 19- 20" tall, hard plastic walker, vinyl head with rooted hair, blue sleep eyes, jointed at knees, high heel feet, Miss Revlon look a like, may have been dressed as a bride doll, made by Doll Bodies, Inc. of New York. Her box states "She's my high heel playmate, nylon hose and pretty dress, of all the many dolls I have, I love my teenage LuAnn best, with vinyl head and rooted wig, to comb, wash or curl."